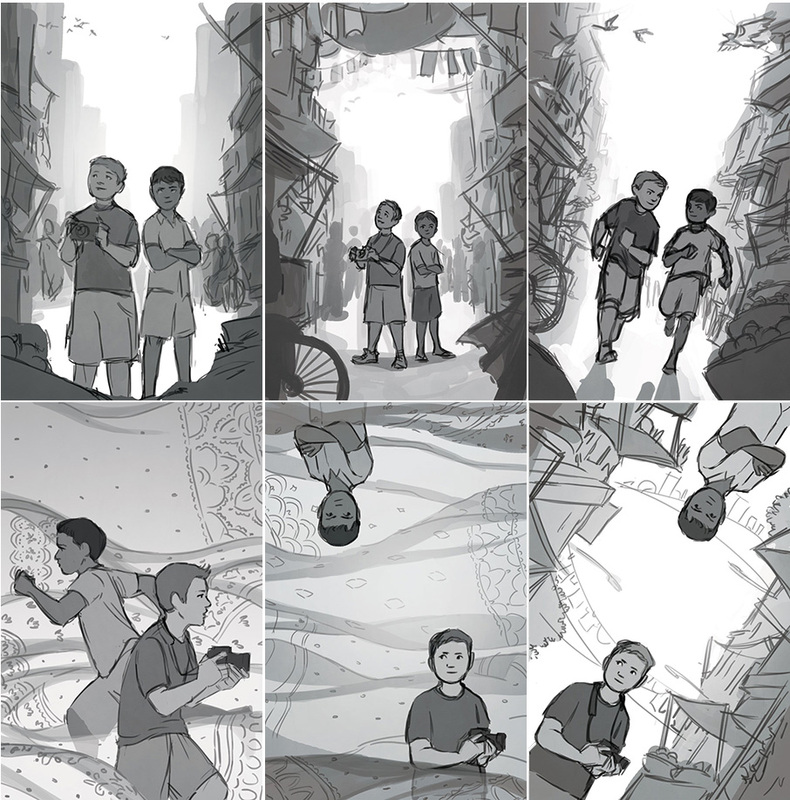 Sometimes the process of a book cover comes together quickly and easily. Other times its evolution is longer and more convoluted. This.............is one of the latter times. 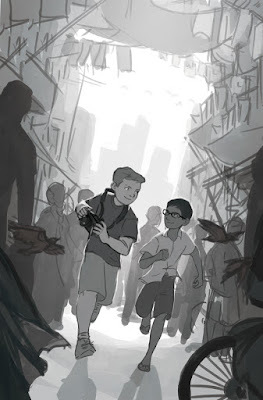 Grab some chai and some papadums, blog readers, because this is going to take a while. When aspiring photographer Dylan Moore is invited to join his best friend Rohit Lal on a family trip to India, he jumps at the chance to embark on an exciting journey...But each boy comes to the trip with a problem: Rohit is desperate to convince his parents not to leave him behind in Mumbai to finish school, and Dylan is desperate to use his time in India to prove himself as a photographer and to avoid his parents' constant fighting. Keeping their struggles to themselves threatens to tear the boys apart. 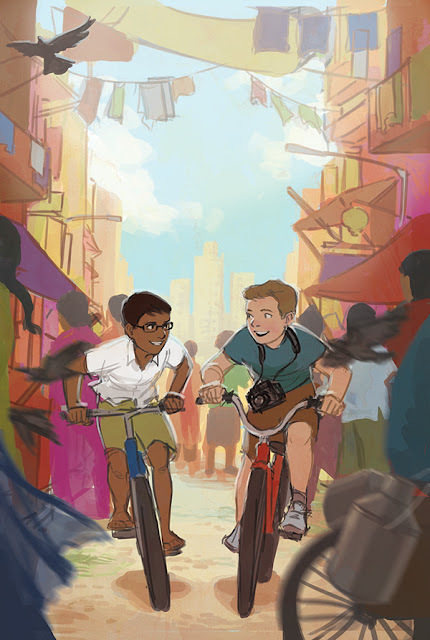 So, I gathered that the themes would be the power of friendship overcoming differences in culture. The AD at Scholastic told me that she and the editor didn't have a specific vision for the cover, but they knew that they wanted "to show Dylan (maybe with his camera) and Rohit in the hustle and bustle of vibrant Mumbai." Usually I do three rough sketches for book covers, but since the ADs were open to ideas, I decided to do more roughs than usual, to give the team lots of options. The AD told me that they liked the "action poses" of #3 the best, but it still needed work. 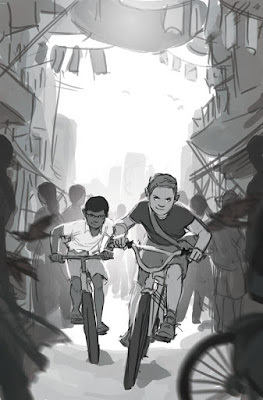 They asked to see the boys more clearly drawn, and to see an option of them riding their bikes. 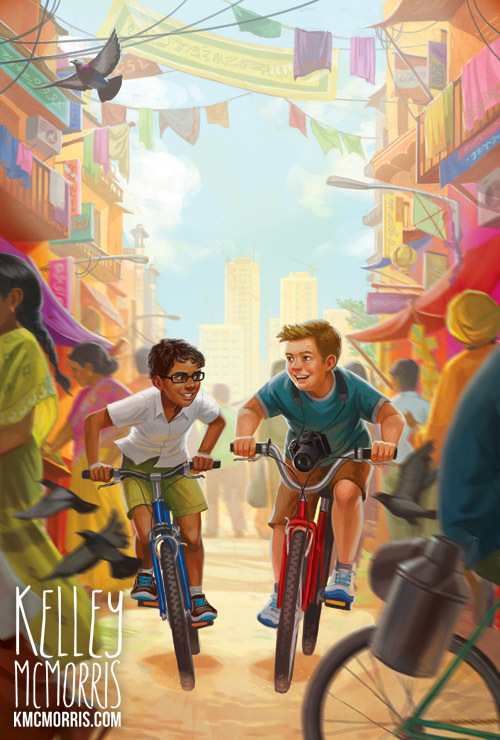 I also threw in a holi festival, as it would be an excuse to show a super colorful, super Indian scene on the cover. The AD appreciated the holi suggestion, but said that there was no holi festival in the book. 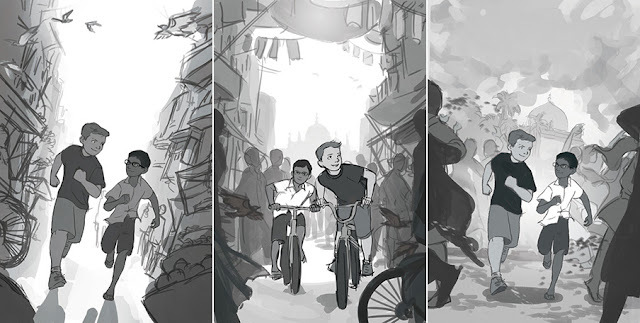 She and the editor liked the environment in rough #2 the best, and wanted to see the boys running and biking through that scene. So close, but still not quite there! The AD said the team liked the biking scene, but wanted there to be more of a feeling of friendship and fun. 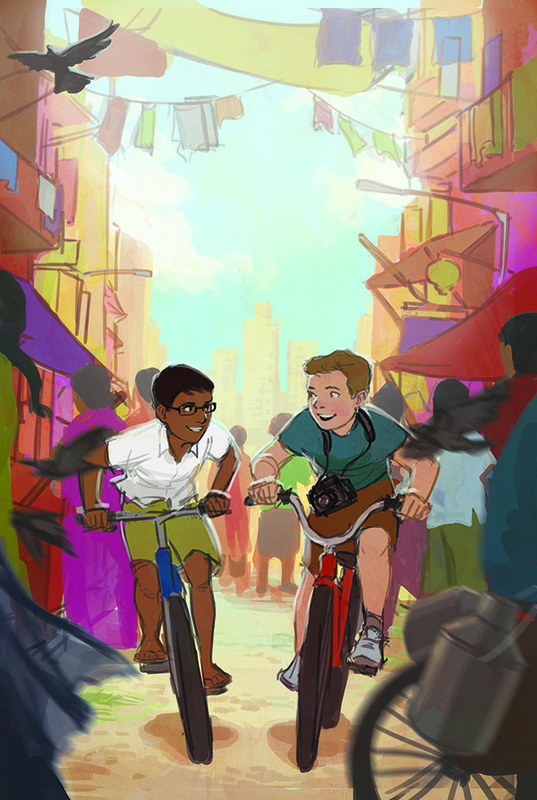 They asked for the boys to be biking together side-by-side with big grins on their faces. With a few more notes about details, I was finally approved to go to final. 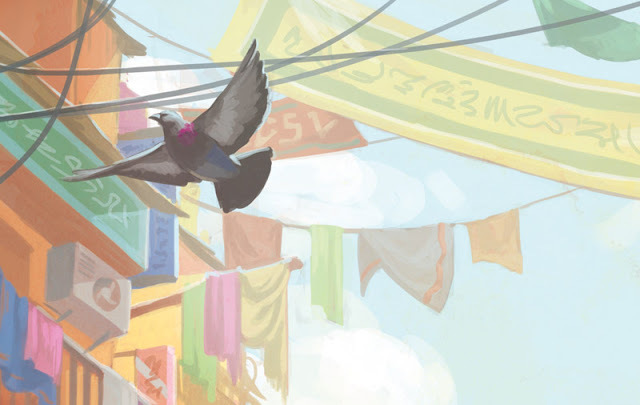 As you can see, there's a lot of detail in this image, so I spent quite a lot of time on it, more than any other book cover previously. 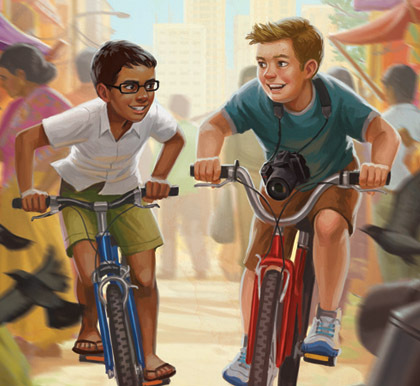 I also consulted with some Indian friends about anything I could add to the scene to make it look more like Mumbai. While the AD said it looked "gorgeous," she also said that the editor wanted Dylan to look chubbier. 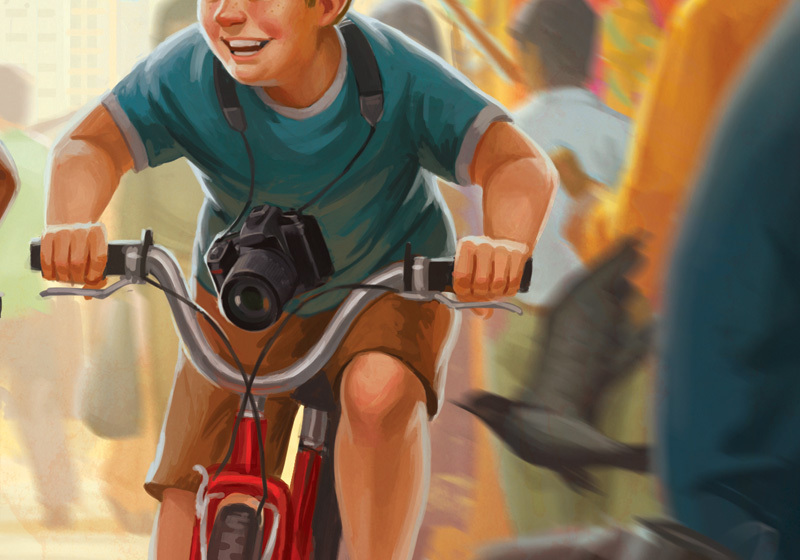 Apparently in the book, Dylan's father is pressuring him to lose weight, so they wanted him to look "a little huskier." So, I tried to bulk him up a little, but not too much. "He's about halfway there," they said. A little more, they said. 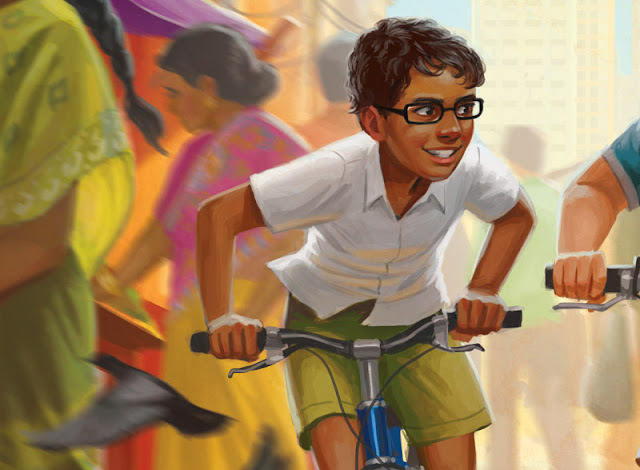 Then after a few more tweaks to Rohit, including changing his shoes and his hair, the cover was finally finished! 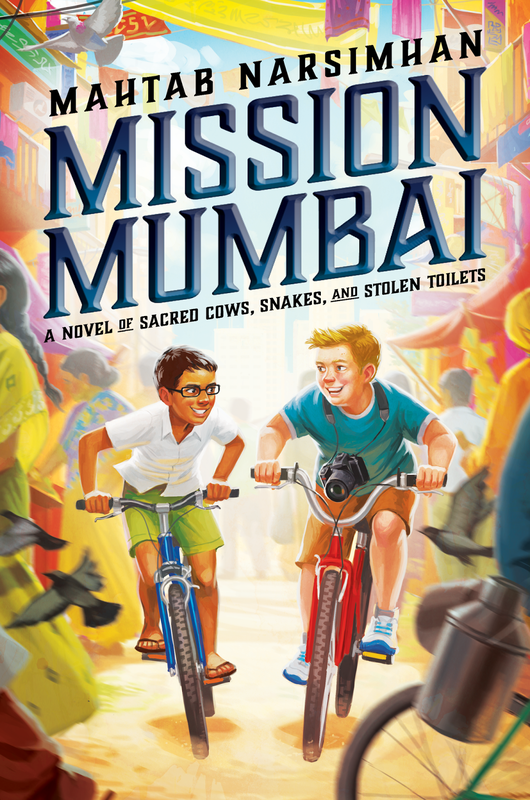 Mission Mumbai comes out today, March 1st, in Canada and March 29th in the US. Whew! I deserve some butter naan for this. Yeah drawing the kids riding bikes was a first for me. Luckily at this angle I didn't have to draw the spokes in the wheels! Hi Kelly, this is looking awesome! Adding up pair of pigeon is just icing on the cake! Great work.